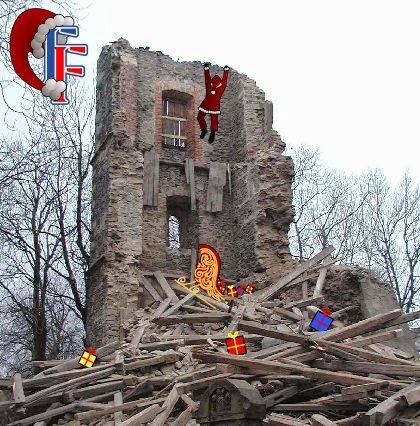 Structural hazards are common during Christmas! Love it or loathe it, it's that time of year again. In the calm, measured words of Noddy Holder... "IT'S CHRIIIISTMAS!" As usual, we will be working flat out until our Christmas break making thousands of your favourite fixings, offering technical advice and providing specifications, before rewarding our staff with a well-earned rest for the Christmas week. Christmas is perhaps the most perillous time of year in our industry. Hazards to buildings are rife! However, with our advice, your building should remain standing into the New Year. With our head office being based in the UK, we are fully aware that it will, of course, be a white Christmas. It is worth checking over the next couple of weeks to ensure that your warm roof is properly attached with Skew Fast as the snow will add additional weight to it. With the extra snow and and nine reindeer at 150kg each, the weight may make your house creak. Be sure to check that your foundations are capable of taking this additional load. If not, you can always reinforce with Heli Pile. After you have finished your Christmas turkey, be sure to double-check your chimney to see if there is any cracking. It may be a short term problem caused by a portly gentleman delivering presents, but there is always a possibility that it could be a long term problem that we can solve with Bar Flex! On the subject of Father Christmas, I'm reliably informed that the name and figure of "Santa Claus" comes from our Dutch friends. Sinterklaas is traditionally a serious, elderly man who rides a white horse called Amerigo. Sorry Rudolph! Of course, if you have any queries on structural problems that may occur over Christmas, please call our installation arm, Target Structural. Their website will be live in the new year... just in time! In all seriousness though, we will be finishing at 5:00pm on Tuesday 23 December 2014 and will be returning in the new year at 9:00am on Monday 5 January 2015. Orders placed after 5:00pm on Monday 22 December will be dispatched to arrive in the new year. We wish you all a wonderful and relaxing Christmas whatever you are doing. We look forward to seeing you in the new year, perhaps a little more plump than now! How Does Masonry Reinforcement Work?